Hidden Objects-Halloween 2014 info about the game-Games2Rule. Games2rule brought another new hidden objects game is called Hidden Objects-Halloween 2014. It's the time to use your observing skills to discover the hidden objects in this game. 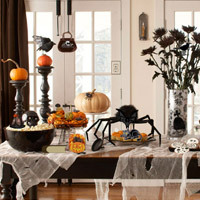 Find the hidden objects in this Halloween decor room within the time duration to get high score. 20 seconds from your will be reduced for every wrong click. Have fun.